In the hours before I left the US to return to Thailand, I completed some shopping for Ron and Kari. Ron and Kari are missionary friends up in Chiang Mai, Texans who have lived in both Thailand and Kenya for their missionary work and who are accustomed to suffering without the comforts of home. Before leaving, I asked them what I could bring back for them and the answer was Jell-O instant pudding mix. The market I stopped at had a wider selection of flavors with the house brand, so I loaded up on French Vanilla, Chocolate, Butterscotch, and other flavors. Then I came across pistachio. It wasn’t on their list but I decided to buy a couple of boxes for me, for memory’s sake. Normally I’m against processed foods, particularly those with an ingredient list as disturbing as what you will find in a box of instant pudding mix. Sugar is the first ingredient, followed by different types of starches, followed by a whole host of multisyllabic compounds that fall generally into the “sodium” category. But I decided to get some because of the fond memories I have of my paternal grandmother making pistachio pudding when I was a child, spending time down at her mother’s home in the 1,000-person town of Cole Camp, Missouri. We would spend time down in Cole Camp each summer, playing in the backyard and the park across the street, going on trips to the creek where we would wade in the water and spend a long time holding fishing poles but not catching any fish. And somewhere in those memories is the memory of pistachio pudding, cold, creamy, and bright green with little reconstituted chunks of nuts, served after dinner. Making a batch this week, the smell and taste and texture were all as I had remembered them, although the memories were more enjoyable than the actual eating of the pudding. I guess over time our tastes change, even if the memories don’t. This entry was posted in Uncategorized and tagged Cole Camp, food, JellO, memories, Pistachio, Pudding by christao408. Bookmark the permalink. If it tastes anything as good as pistacchio gelato I want some!! best things to enjoy are those that come with a story connected to your life. 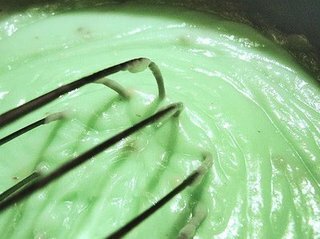 never saw or tasted a pistachio pudding but i want one. the mix looks yummy. btw, did the box have the nuts? I would love to have a bite too! Pistachio is one of my favorite flavors. @Renatojr3 – Yeah, the nuts are in there somehow. When you look at the mix straight out of the box, it appears to only be powder. But somehow they have little bits of nuts in there, too, which reconstitute with the milk. All the more reason to look at it with suspicion! @Dezinerdreams – I agree about the flavor and wonder if one could make a good pistachio pudding from scratch. @Made2Order – Their fries are good, I’ll give you that. The other things on the menu aren’t really that note-worthy. @aPieceOfTheSky – Glad you enjoyed that concluding sentence. Guess I was in a philosophical moment! @lil_squirrel4ever – Oh, I’m going to guess that the gelato would win over the pudding, big time! My grandmother would make cream puffs and then slice them and fill with the pistachio pudding. The final step was the dusting with powdered sugar. Yeah. I love the pistachio pudding. Still tastes good to me – especially frozen. I’ve made pistachio pudding too for old times sake and discovered the same thing, that the memories or better than the pudding. Tapioca pudding is another pudding that brings back good memories as well. i think the only time i had pistachio pudding was when it was mixed into some fruit concoction that sort of resembled ambrosia (i forget exactly what it was, this was quite a while ago). @oldpartner – I find that tapioca pudding holds up better in the taste department, though. @kunhuo42 – Pistachio pudding salad! With marshmallows, right? @murisopsis – That would be one way to use the leftover pudding in my fridge! @amygwen – Vibrant, isn’t it? Great post. I love pistachio. The pudding is good, but the nuts themselves, those that come from Iran, are huge and so good to peel and eat. Mother used to make a pistachio dessert with cream and eggs. It used to taste heavenly. @christao408 – yes, that was it! i guess i should have remembered the name of that! No reason you couldn’t make pistachio pudding from scratch. I’ll wager it will have the same texture, but probably a fresher, albeit different, taste. Lots of corn in those boxed puddings, although it’s well disguised. Mmm don’t think I would like Pistachio. They are not easily available here anyway. I like my puddings simple – chocolate and butterscotch are fine for me. You know come to think of it, I don’t think I’ve ever tried pistachio, much less pistachio pudding! I haven’t waned in my adoration of pistachio pudding but my body’s ability to process the stuff sure has. but this also reminds me of the first time I was old enough to buy scotch and I added the stuff into butterscotch pudding and watched how fast scotch disappears into the foods- but not the alcohol…. beware of alcoholic pudding! @ZSA_MD – Oh, do you happen to recall the recipe for that dessert, by any chance? @TheCheshireGrins – I can’t imagine that you’d ruin them, Meg. With all the love you would add, I’m sure they would turn out wonderfully. @jandsschultz – That’s probably what those little chunks of nuts are in reality! @onmovement – Well, I’m sure there are some boxes in the Vancouver Safeway… but I think you might be a bit disappointed. @I_once_was – Hmmm… have you been looking over my shoulder? A little orange flavored Grey Goose vodka might add a fresh note to pistachio pudding… =D@albertmoore – Thank you, Albert. @Roadlesstaken – Really, never tried the nuts? Allergies? @Umnenga – Some would say that butterscotch is quite the hi-end flavor, anything but simple! =D@vsan79 – Well, I don’t know that you really need to rush out and have it. But the packages will be sitting there, waiting patiently should you decide you want some. ohhh wow that’s a really bright green. ive never had pistachio pudding before but i imagine it to be a little like pistachio ice cream (which i luuuuuv)! @christao408 – No Chris, I don’t but I am going to try and make some just by the memory of the taste and see if it comes close. If it does, I will share it with you. @Made2Order – lol, nah these days i prefer better food like the stuff you make in your blog, haha. @aPieceOfTheSky – the stuff i make, you can make them too! it’s easy. @christao408 – not even mcnuggets?! @christao408 – not allergic, just haven’t had the opportunity. Here Butterscotch pudding is low end.I remember in preschool on Fridays getting a little cup of it. I think because its a compromise between those who like vanilla and those who like chocolate. I like pistachios but never tried the pudding before. I remember chocolate pudding though. I also remember stuff like Dream Whip (powder that miracalously turned into whipped cream) and Tang! @ElusiveWords – The breakfast drink of astronauts! Never quite acquired a taste for it.